Drawing a hyperboloid seems like a fairly straightforward task. In a world where architects are accustomed to creating complicated, non-uniform, free-form surfaces, the hyperboloid is a relatively regular shape. It seems trivial. Right now you’ve probably thought of three ways to draw a hyperboloid. I can tell you: they are all wrong. For the past five years I’ve been drawing hyperboloids. Working as an assistant to Mark Burry on Antoni Gaudí’s Sagrada Família, I’ve drawn hyperboloids over and over. I’ve never quite managed to draw a totally accurate one in Rhino (often we have to use more sophisticated software like CATIA). My quest to draw the perfect hyperboloid has taken me progressively deeper into the geometry engine underlying NURBs based CAD programs like Rhino. Last month, I finally found a way to draw an accurate hyperboloid. My hyperboloid drawing method derives from the underlying mathematics of NURBs surfaces. Despite the reliance on NURBs in contemporary architecture, I’ve never read anything about this fundamental geometric formula, much less about how to manipulate this formula to draw accurate shapes. In this post I’ll outline a number of methods for drawing hyperboloids. In the process I’ll expose the mechanisms of NURBs and show how you too can take advantage of these formulas to draw mathematically accurate shapes. A hyperboloid can be made by twisting either end of a cylinder. A hyperboloid can be generated intuitively by taking a cylinder and twisting one end. Twist tight enough and you’ll get two cones meeting at a point. Twist gently and you’ll get a shape somewhere between a cone and a cylinder: a hyperboloid. Depending on how you look at it, it is either a cylinder that flairs outwards or a cone that never quite comes to a point. The hyperboloid is a doubly ruled surface. That is to say, for any point on the hyperboloid, two perfectly straight lines can be drawn on the surface passing through that point. This is the unique property of doubly ruled surfaces: although they are curved, you can always find a straight line on them. The interior of the Sagrada Família looks complicated but if you study the geometry closely you’ll see that it is composed using a series of mathematical rules. In this case, the ceiling comprises of hyperboloids. The triangular cutouts follow the ruled geometry of the hyperboloids. Much of Gaudí’s architecture is composed from doubly ruled surfaces (hyperboloids, hyperbolic paraboloids, helicoids, and planes). Gaudí rarely wrote about his design methods, so we can’t be certain as to why he favoured using doubly ruled surfaces. One possible reason is that the straight lines make the curves easy to specify. Unlike most other curved surfaces, the hyperboloid can be communicated intuitively and without any drawings. All a stone mason needs is the radius of the cylinder, the length, and the amount it has been twisted. To verify the surface is correct, you can just run a ruler along the surface. This type of construction logic always astounds me about Gaudí’s architecture. At first glance you see complicated curved surfaces, but if you look closely there is an elegant rational to his forms that make them possible to construct, even prior to the computer. Most of my work for Mark Burry on Gaudí’s Sagrada Família involves hyperboloids in some way. Even projects I’ve worked on outside the Sagrada Família (although still with Mark), such as the Responsive Acoustic Surface and the Fab Pod, are a comprised of hyperboloids. I’ve milled hyperboloids from plywood, I’ve made them with spun metal, 3d printers, and plaster. On my 24th birthday, my girlfriend at the time made me a hyperboloid shaped cake. In this strange way, hyperboloids have become a regular part of what I do. 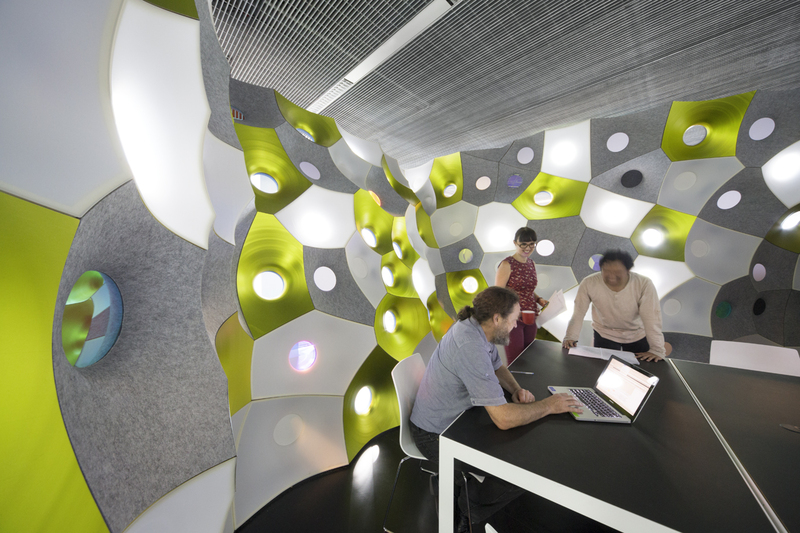 The Fab Pod is made from hyperboloids positioned to optimise their acoustic properties. Photograph by John Gollings. While hyperboloids are easy to explain, they are difficult to draw in Rhino. The easiest way to draw a hyperboloid is to follow the explanation I’ve given above. Draw two offset circles (the two ends of the cylinder), twist one of the circles, draw a line between the circles, and create a revolved surface using that line. The code below shows how to do this. Unfortunately, you often end up with weird artefacts at the neck of the hyperboloid (shown below). This has to do with how the revolved line skews the UV curves of the hyperboloid surface. The construction logic of the hyperboloid doesn’t necessarily translate into the computer. These striations in the neck of the hyperboloid come from the meshing algorithm. The twist makes everything somewhat inaccurate. Create revolved surface from line between circles. These points were positioned using the hyperboloid formula. The surface was then interpolated through the points to generate the hyperboloid. While the points are accurate, the surface is still not entirely precise. Using this formula, we can generate any point on the hyperboloid. If we generate enough points, we can create a interpolated surface through the points. Create revolved surface from hyperbola. Scale to match proportions of hyperboloid. For a number of years this was the method I used to draw hyperboloids. From a distance it looks good, but if you examine the surface closely you’ll notice some slight inaccuracies. The points are in the right place, but the parts in-between – the parts that were interpolated – are sometimes too flat or too bent. This is because the interpolated curve is following the NURBs formula rather than the hyperboloid formula. The curve passes through all the points we defined but the curve is not following the mathematical formula we used. In a section through a hyperboloid you can see the difference between an interpolated hyperboloid (red) and an accurate one (blue). The difference is visually minor but fairly severe in a practical sense. The inaccuracy can be reduced somewhat by increasing the number of points (which effectively reduces the distance of interpolation). Unfortunately, increasing the points also increases the computational complexity of the surface. At a certain density, the surfaces become unmanageable. This can be slightly mitigated by using fewer points in the flatter areas of the hyperboloid and more points in the curved section. Even then, the inaccuracy is only reduced and never eliminated. There will always be problems with the surface. Excel spreadsheet containing names and positions of hyperboloids. Some data has been obscured. Recently on the Sagrada Família we once again ran into the problem with the accuracy of the hyperboloids in Rhino. I began investigating how Rhino drew native elements like circles, which didn’t seem to suffer from any interpolation problems. They were always perfect. My initial assumption was that Rhino handled these native elements differently to other free-form NURBs curves. It seemed that Rhino was somehow using the formula for the circle instead of the NURBs formula. I was half-right. Rhino does use the formula for the circle but only via the NURBs formula. In other words, Rhino manipulates the inputs to the NURBs formula in such a way that it becomes the circle formula. On Wikipedia there is even an example of how to draw a perfect circle using NURBs. The table above gives the location for a set of control points that define a circle. The NURBs curve loosely traces path of these points, getting pulled towards the weightier points and passing more directly past the lighter points. These points don’t produce a free-form NURBs curve that approximates a circle, rather, when these precise values are entered into the NURBs formula, the NURBs formula becomes the formula for a circle. This is true of many analytic shapes. If you know the NURBs formula, you can manipulate the input variables to transform the NURBs formula into everything from the formula for a circle to the formula for a hyperboloid. And n is the degree of the curve. Where B is the Bernstein polynomial. Since the hyperboloid is a continuous shape, the Bézier formula can be used to derive the points and weights needed to draw a hyperboloid. Before drawing the 3d hyperboloid, we will first draw the 2d profile: a hyperbola. There is a hyperbola tool in Rhino but there isn’t any way to generate a hyperbola algorithmically. You could draw one using an interpolated curve, but as I’ve shown above, this will produce inaccurate results. The only way to draw a hyperbola accurately is to turn the formula for the Bézier curve into the formula for a hyperbola. A hyperbola drawn on the XZ plan. To draw this hyperbola we need to calculate P0, P1, P2, and q. All of a sudden there are only six unknowns in the Bézier formula: P0, P1, P2, & their corresponding weights. We just have to find these six values such that the formula equals the hyperbola formula (see diagram above to get a sense for how these points relate to the hyperbola). The only variables outstanding are P1 and w1. We know that P1 lies on the x-axis, so P1.z must equal zero. We also know that the ends of a Bézier curve are always tangental to the control points. In other words, the line between P1 and P0 is tangental to the hyperbola at P0. and x’, z’ is the point on the hyperbola we are calculating the tangent for (P0). And with that, we have all the variables for defining a hyperbola (P0, P1, P2, w0, w1, w2). Putting this all into Rhino Python, you end up with the code below. Draws a hyperbola on the XZ plane, centred at 0,0,0. This code produces the hyperboloid below. It is a hyperboloid defined by only twenty-four control points, all weighted perfectly to give an absolutely precise hyperboloid. The geometry is lightweight, accurate, and splits cleanly with ruled lines. It has taken me a long time to get to this stage, but I finally feel like I understand – and can therefore control – the equations underlying software like Rhino. Hopefully this post has given you some insight into the underlying equations of CAD software and how they can be manipulated. And if not, hopefully you’ve at least learnt the many ways to draw a hyperboloid. An mathematically accurate hyperboloid defined from just 24 control points. All code in this post licensed under Creative Commons attribution. Loved the article! Well-explained and clearly written. Curious about what CATIA would generate. Did you run any tests? Hey Mahar, I haven’t done an explicit test but on occasion I have ended up in a situation where the Rhino model doesn’t quite match the CATIA model. This is to do with how I was modeling geometry in Rhino. CATIA has a lot of inbuilt checks and balances that ensures the integrity of the surfaces, so we haven’t experienced any accuracy problems in CATIA. I hope to create a frame using small pieces of wood, around which to wrap fabric and then to use as a mould for possibly clay or plaster of paris …?? Hey Nick, a while ago I cast some plaster hyperboloids. You can see the process here: https://www.danieldavis.com/responsive-acoustic-surfaces/ Basically, we cast the negative shape by spinning plaster and using a hyperbola template to shape it into a hyperboloid. We then cast the positive shape over the top of the negative to produce a hyperboloid shaped shell. Be warned however, it is a difficult shape to cast, we spent a few weeks learning how to do it! We can draw the geometry of hyperbola in ANSYS APDL as well. All we need to have is the dimensions of the geometry, we know the equations. Generate the coordinates in excel,by feeding the equation and then import in ANSYS. Then from these plotted points we draw a spline. We copy this spline at distance equal to the desired thickness of the hyperboloid shell in order to make area and then we can extrude this area around a defined axis to create the hyperboloid geometry (volume). The artifact of the first method that you showed might be the result of Rhino trying to display the nurbs surface with an underlying mesh. A lot of the time the surface might be smooth but the underlying mesh is rough, thus zig-zaging artifacts occur. If you rebuild the surface with a denser UV grid or convert the surface to a very fine mesh, you might see that the surface is actually smooth.